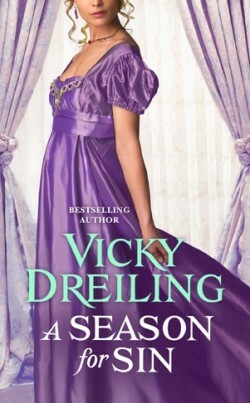 Vicky Dreiling combines again a reality TV competition theme with a historical romance. And again I love it! WHAT A DEVILISH DUKE DESIRES was the perfect blend of fun that I like to read in my historical romances. It doesn’t take itself too seriously and manages to keep me interested in the story the whole time. We have Harry Norcliffe, who doesn’t want his uncle’s title. He’s a simple guy and not too concerned with the dreadful commitments of the ton. His mother has other plans for him and decides to do her best to find him a good bride. I absolutely adored him! He’s the type of guy you want to sit and banter with, and from his first meeting with Lucy it’s always been easy to see their perfect chemistry. Lucy is not what his mother would say his bride needs to be. She works a few jobs to keep a roof over her family, taking care of her grandmother. All while trying to reach her dream and being a dance teacher. And here’s where the reality TV aspect comes into play. There will be a dance competition! Think a type of Dancing with the Stars. The ton is all buzzing with which couples will compete and who will make it until the end. And they are seeking guidance and instruction. Which is where Lucy comes in. Dance teacher, maid, waitress. But with a secret. I love the story of the girl that is down on her luck and finds that one man that will do anything to rescue her. And that’s exactly what Harry does even before her past comes out. This is still one of my favorite historical romance series because I always know what I’ll get, and that is a lot of sizzling chemistry wrapped in an enthralling story. Always satisfying. It hasn’t disappointed me yet and I wait with anticipation for every installment. Francesca thank you so much! Thanks for the review, this book sounds good. Thanks ladies hope you get to read this soon!